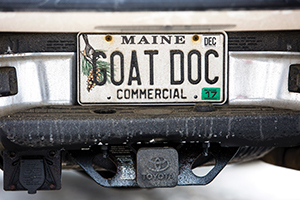 On a cloudy February morning in Pownal, Maine, Cara Sammons-Shepard, V16, knelt down on a thick bed of straw and stroked an ultrasound probe across the belly of an Alpine goat named Jolie. The other goats in the shed seemed to bleat encouragement while the farmers, Jodi Bragdon and Jim Niemi, helped hold the patient. Jolie struggled a bit but mostly seemed just curious about what was going on. Within minutes, Sammons-Shepard was ready with her verdict: Jolie was pregnant. “Ohh…” the farmers said in unison and in wonder. 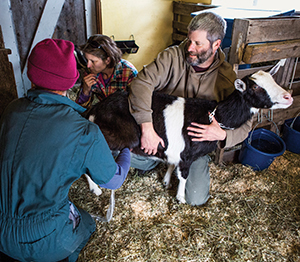 Cara Sammons-Shepard, V16, performs an ultrasound, while Jodi Bragdon and Jim Niemi of Chigobee Farm look on. Although she cares for animals of many kinds as a traveling veterinarian, Sammons-Shepard is developing a niche: About 80 percent of her farm calls are for goats. These playful, intelligent ruminants led her to become a veterinarian. In doing so, she was following a passion, but also filling a need for farmers. It’s no exaggeration to say that Cara Sammons-Shepard and her husband, Devin Shepard, owe their current careers to a goat named Grace. Both grew up in central Maine. He became a boat builder and diesel mechanic. She studied glassblowing at the Massachusetts College of Art and Design, education at the University of New England, and taught elementary and high school art classes for four years. In 2007, they were looking for a companion for her horse, Petey, and bought their first goat, Grace. “We chose the one with the most blue ribbons,” Sammons-Shepard said. Grace and Petey bonded, and so, apparently, did Grace and her new owners, because soon they bought two more goats. And with them, came the milk. Her husband and Flying Goat Farm’s head cheesemaker, Devin Shephard, at work. When they had more than they could drink, Shepard started making cheese. He gave it away to family and friends, and eventually started selling to restaurants. In 2013, a successful Kickstarter campaign helped them buy dairy equipment from a retiring farmer, and the business, called Flying Goat Farm, took off. Today, their herd of some 30 Nubian goats produce about 25 gallons of milk a day, enough to make up to 100 pounds of “goat gouda” and camembert-style soft cheese a week. 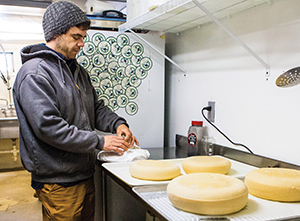 Shepard still builds boats, but the cheese-making is more than a full-time job. Running a farm was much more work than they imagined, and one of the hardest parts was finding medical advice. “I was frustrated pretty much right off the bat,” Sammons-Shepard said. As soon as Grace had her first baby, she developed mastitis, an inflammation of the udder. The vet they used for Petey was an excellent equine vet, but admitted that she did not know much about goats. “No one knew what to do, basically,” Sammons-Shepard said. The couple learned everything they could by shadowing an experienced goat farmer, and by trial and error as their herd grew. Eventually, other goat owners turned to them for advice. Then, in 2010, a neighbor asked for help with a goat that had been in labor for two days. Sammons-Shepard discovered that it was breech birth: Both unborn babies had died, and the mother goat was in very rough shape. Although Sammons-Shepard had always been squeamish about medical procedures (“I still can’t watch my own blood being drawn,” she said), she managed to pull the kids out and save the mother’s life. “I thought, this was really hard and scary, but you gotta do what you gotta do to try to save this animal,” she said. That was the day she thought, maybe I can do this for a living. That summer, she assisted at a veterinary clinic, and started prevet classes at the University of Southern Maine. She eventually gave up her teaching jobs and enrollment at Cummings School of Veterinary Medicine soon followed; she rented an apartment in Grafton, took classes during the week, and drove home on Friday nights. One Sunday night she stayed up all night at the farm with a kidding goat and drove back to Grafton Monday morning just in time to pass a P-Chem exam. Today, she works in a small-animal clinic in New Hampshire two-and-a-half days a week, taking care of dogs, cats, and the occasional geriatric rabbit. The rest of the time, she’s on the road tending to horses, pigs, sheep, and of course, goats. During last year’s kidding season, she didn’t have a day off between April and July. Sammons-Shepard’s website shows an official service area that is about a two-hour radius from her home farm in Acton, Maine. But chances are if a farmer or livestock owner outside that circle needs her—especially those in areas with difficulty getting veterinary care—she’ll find a way to get there, even if it means long days on the road. Sammons-Shepard enjoys a moment with her dogs. 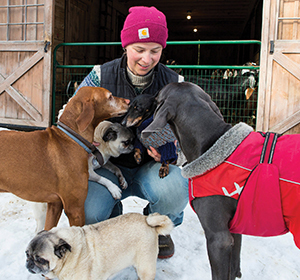 Sammons-Shepard downplays the effort she goes through to get to her clients, but the state of Maine recognizes that large-animal vets like her are filling a serious need. If she dedicates a certain number of hours per week to caring for food animals, the state finance authority forgives a percentage of one of her education loans. And if she provides care in an area that is considered underserved—there is currently one area in the state with a coverage gap— a federal loan forgiveness program also kicks in. If a client is very far away, she might ask for a video of the animal. While she can’t diagnose online, this “triage by email” helps her know if the patient can wait for her to visit, or if she needs immediate care. Being a goat doc comes with its difficulties. Goats are considered a “minor” species, which means that drug companies don’t focus on making products for them the way they do for cows and dogs. “There are very few medications that even say ‘goats’ on the label,” said Sammons-Shepard. Not even a rabies vaccine. “That makes it challenging.” So she has to get creative. Because canine medicine is constantly evolving, she is sometimes able to translate those findings to goats. Equine medicine provides clues, too. As she sees more goats reaching old age, she has considered glucosamine supplements and joint injections to control arthritis pain, as she has done with horses. But more than that, she just loves the day-to-day work of washing off her overboots, loading up her truck, and heading out to the next kidding call.